Product prices and availability are accurate as of 2019-04-16 10:19:14 UTC and are subject to change. Any price and availability information displayed on http://www.amazon.com/ at the time of purchase will apply to the purchase of this product. 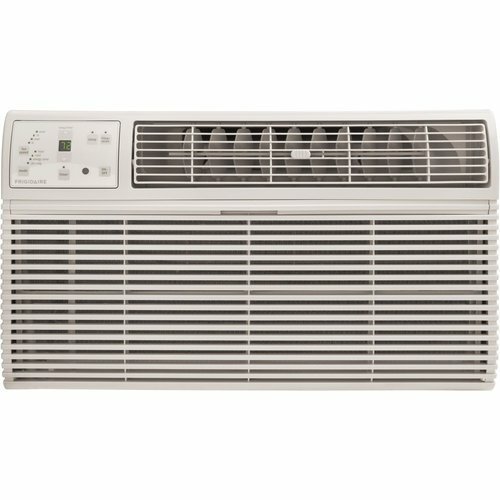 Through-the-Wall Air Conditioner with 10,600 BTU Heat and 3 Fan Speeds Frigidaire's FRA10EHT2 10,000 BTU Cool/10,600 BTU Heat Through-the-Wall Air Conditioner with Heat is perfect for medium rooms up to 500 square feet. This unit features electronic controls and full function remote control with heat. It also includes 4-way air direction control and multi-speeds. This versatile unit offers a supplemental heat capability, providing you with an additional heat source when needed. The antimicrobial filter reduces bacteria, room odors, and other airborne particles for a comfortable environment. And the Clean Filter Alert notifies you when the filter needs to be cleaned. Features: 10,000 / 9,800 BTU cooling capacity 10,600 / 8,600 BTU heating capacity Cools room sizes up to 500 sq. ft. 4-way air direction control Antimicrobial mesh filter, clean filter alert, slide-out filter access Ready-Select electronic controls Low voltage start-up Full-function remote control with heat 3 speeds/cool, 3 speeds/fan, 3 speeds/heat Sleep mode; 24 hour on/off timer Includes: Universal trim kit Specifications: BTU (Cool/Heat): 10,600 / 9,800 500 Sq. Ft. Cooling Area 9.4 Energy Efficiency Ratio 230 / 208 Volts Amps (Cool/Heat): 5.3 / 15.5 Watts (Cool/Heat): 1,060 / 3,450 Air Flow CFM (High/Medium/Low): 292 / 267 / 243 R410a Refrigerant Dimensions: 24"W x 20-1/2"D x 14-1/2"H Full 1 year warranty parts & labor, Limited 2-5 year warranty-sealed system Frigidaire is the brand you have come to know and trust. And for good reason. Year after year, Frigidaire has been the most reliable brand among leading appliance brands with the lowest number of service calls. With Frigidaire, you can be sure you'll receive effortless features and quality materials, giving you the highest quality performance for the life of your appliances.